This is a follow-up to a post from a couple of weeks ago about the future of the legal history book. I'm now back from the annual of the Southern Historical Association and a meeting of the American Society for Legal History in Baltimore; had an even better time than usual. Lots of terrific panels, new faces, and an excellent discussion of the future of the legal history book. Exhausting weekend, though--two major conferences in one week. I don't have the energy to do that sort of thing anymore. One thing that was really cool for a person like me who writes on cemetery law: Robert Gordon gave the legal history keynote address in Westminster Hall (what was once the Westminster Presbyterian Church) on Friday evening. Pretty interesting story here: the church was built over a graveyard in the 1850s, so that the graveyard (which dates to the late eighteenth century) would comply with a Baltimore ordinance that graveyards had to be adjacent to churches. Afterward Professor Gordon's talk we were given a tour of the catacombs under the church. Edgar Allen Poe, btw, is buried in the churchyard. Clive Pridle of Public Affairs gave a fascinating talk about what trade editors are looking for--basically an exciting narrative. Often times those narratives come in history (and even legal history) books. Along these lines, you will be interested in Dedi Felman's excellent piece in the Chronicle of Higher Ed on July 21, 2006, "What Book Editors Are Looking For?" Her article's provides perhaps the most useful 1200 words ever written for people who're thinking about writing an academic book. 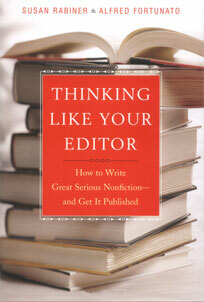 For an expanded version of advice to authors, you'll want to read Susan Rabiner's Thinking Like Your Editor. Read it; you'll love it. Peter Hoffer spoke about the series he edits at Kansas on important cases. The books in it are priced for adoption. They've adopted some cost-cutting procedures (like eliminating footnotes). I'm of a mixed mind here. I doubt that many students ever look at footnotes, though I do think that they're helpful in keeping faithful to the evidence. For a student text, I'm not sure footnotes matter much. Hoffer also spoke about other considerations in terms of making books accessible and inviting to readers. Herb Johnson spoke about ways to promote books--mostly things that academic presses don't have the money to do much of these days. I was a little surprised that there wasn't more talk about the economics of the academic book. I wanted to talk mostly the place of book reviews in promoting discussion of ideas. So I had only a few thoughts on the economics of it; most of my thinking along these lines looks at the cost of books and the implications for authors. Our chair, Princeton University Professor Hendrick Hartog (propertyprofs in particular really need to read his Public Property and Private Power), brought some much-needed reality to the panel. He focused on the coming crunch in publishing. I had expected others to talk more about the skyrocketing production costs, the shrinking library budgets, shrinking subventions by universities to presses, and then dire predications about the future. 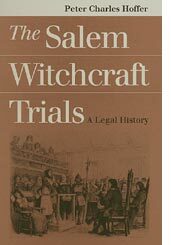 As I indicated a couple of weeks ago, I think that people who write on American legal history can still count on sales to law libraries, as well as general libraries. But I'm becoming increasingly worried for everyone--and especially those who work in areas outside of American history. There are a couple of related problems here. Universities are shrinking their budgets for university presses. Each tub on its own bottom--a phrase we're hearing increasingly in universities leads to the relatively well-off parts of the university to do better. Other divisions are, well, left to fend for themselves. As university subsidies for their presses shrink, that means books have to generate more income. That comes from selling more or charging more. Library budgets are shrinking, at least for books. So that leads to fewer sales. And since a lot of academic books have the lion's share of their sales from the libraries, as libraries have less money, the presses are forced to raise the price of their volumes. Together, those factors make it so much more difficult to get books out an affordable price. For a few legal historians, significant sales come from class adoptions. James Ely's The Guardian of Every Other Right is one book that I've assigned frequently over the years. It's now in its third edition. I always assign Morton Horwitz' Transformation of American Law, 1780-1860. So do lots of other people. But few legal history books are so lucky. So, where are we left? I think we're going to see fewer books being published. There will be more pressure for universities to provide subventions to presses to help them put out books at a reasonable cost. Because law schools have money, their faculty may be able to weather this crises better than history faculty. And I think that American legal history has the potential for some more library sales than many other areas. Perhaps peer reviewed journals (which are facing the same kinds of problems detailed above of rising costs and fewer sales) and maybe law journals will take up some of the role that university presses have traditionally served. Well, enjoyed chatting this semester. I'm going to get back to classes, finish my contribution to the Morton Horwitz festschrift, on the Fugitive Slave Act in American Jurisprudence, edit a couple of articles, and grade exams. Enjoy Thanksgiving and the Winter holidays! I'll be back with you in the spring and maybe once in a while between now and then, if the spirit moves me.